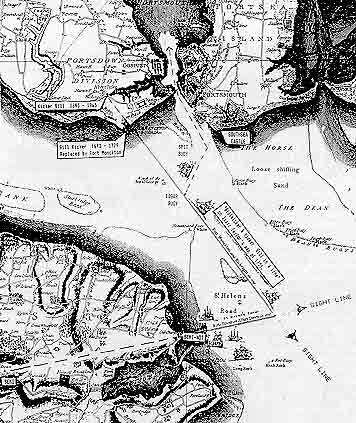 This Map shows navigation guidance between Portsmouth Harbour and St. Helen's dating back to 1643. The map combines information shown on Isaac Taylor's 1759 map and Grimm's of 1776. So what was the derivation of the Alverstoke tower names? No printed explanation for the names of Gill Kicker and Kicker Gill-the original spelling for these towers-was found. Kicker Gill was most probably used to identify the construction contrast with it's partner tower, a reversal of the two words. The author's submission is that Kicker is a civil engineering term that refers to the stub of a column usually formed at the same time as the foundation slab, which provides the shape and location for the next stage of construction of that column. The tower was in fact located a few metres from the River Alver and on a thickly wooded slope.